There are days when I could eat nothing but soup. That’s usually when the weather begins to turn or when it’s really cold outside and the thought of the stove on for hours on end (somtimes less) or the crockpot bubbling away while I practice is just too tempting. If I have alot of other things to do, I might even put the bread machine and the crockpot on at the same time, put on stacks of John Rutter, Take Six, Brooklyn Tabernacle Choir or just my very favorite large choral works. Those might be “Messiah,” of course; Verdi or Mozart “Requiem,” Schubert “Mass in G,” Bach “Magnificat,” etc. Lately the list has expanded while Amazon cleans up in the weeks after the grad music courses. Thanks, Angie. In the summer, however, I shy away from any soup at all except for the occasional cold soup. My husband is the gazpacho maker, so I seldom even do that. 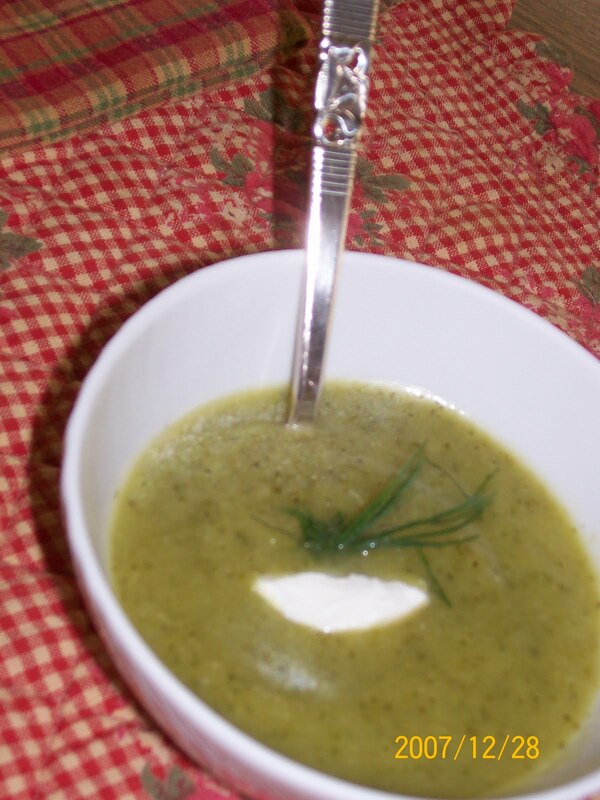 Somehow, this last week, however, zucchini soup recipes began to appear and I thought, “Surely I can improve on that.” I don’t have a ton of zucchini because I live on solid bedrock with a yard full of deer, lizards and the occasional mountain lion and bear. Flowers I can do; veg–no. The farmers’ markets are full of the stuff whether or not you or a friend grow any–and you might want to shred some and freeze it for winter zucchini bread, omelettes, zucchini cakes (fry ’em up like potato pancakes with a little onion and some egg and flour to hold them together) or whatever strikes your fancy. You could even try this soup. It’s light; add some great bread and a dessert. Perhaps a dish of cheese spread for the bread. I’ll bet you have a friend …or acquaintance… Take the time to call. Invite them for zucchini soup; it’s maybe 30 minutes to make. Ok, so you have to stop by somewhere good for bread and pick up wine (or make iced tea) and grill the peaches for the sundae. You could do it…. In 8 qt. stockpot, melt butter and add onions and carrots. Cook over medium heat until almost limp and add zucchini and garlic. Cook about 10 minutes or until zucchini is losing its crispness, stirring to make sure garlic doesn’t burn. Add stock and simmer until zucchini is tender, perhaps five more minutes. Add all but a few sprigs of dill. Salt and pepper to taste; add hot sauce for zip. Try a few drops at a time and continue tasting until it’s as you like it. You can puree with an immersion blender or in batches in the food processor or you can eat it chunky. Serve in bowls topped with a tish of sour cream and a sprig of dill for garnish. Next: Grilled Peach Sundaes…………Any day this month! Go Colorado peaches! To make grilled peach sundaes, wash and stem fresh peaches. You’ll need half a peach for each serving. Cut each peach in half and remove pit and any residual pit scrapings. Grill on lightly oiled grill over medium heat for about five minutes on each side. Turn carefully and do not try to cook peaches all the way through; they will break and you will have a mess. You just want them well-warmed with nice grill marks. Remove them from grill to cutting board and let sit 1-2 minutes. Slice each half into about four or five pieces and place on top of vanilla ice cream. Serve with cookies if desired. A drizzle of maple syrup or peach brandy would gild the lily, but might be silly-good. Wine: French rose for the whole shebang; try Tavel. Whoa. No alcohol? Make some peach or mint tea. Serve in pretty glasses. ——- Here’s some of my flowers making the entry welcoming this week. It’s mid-August and, while it’s still summer, school is starting in Colorado and there’s a nip in the air evenings. A few leaves are beginning to turn (one whole bush in my south yard), but over all, the sun is still shining and the lush flora from the unusual rainfall is stunning. I missed a long, cool wet summer. Down the street, my gardening neighbors are having the garden club over and the rest are discussing one last camping trip together before snow flies. (which could be anytime in the mountains) I’m ready! At my house, I can finally sit on the deck mornings for a cup of coffee and my breakfast. Most of the late spring and summer, the eastern sun is so strong that that deck is not approachable until evening. We often have 100 degree temps out there in the mornings. The west side could be 55 degrees at the same time. Colorado sun is intense and unlike many other places. Of course, that’s part of why you can get a tan here skiing in January. While we love summer food and the ease of it all, there’s not much we like better than ice cream if we’re talking dessert. 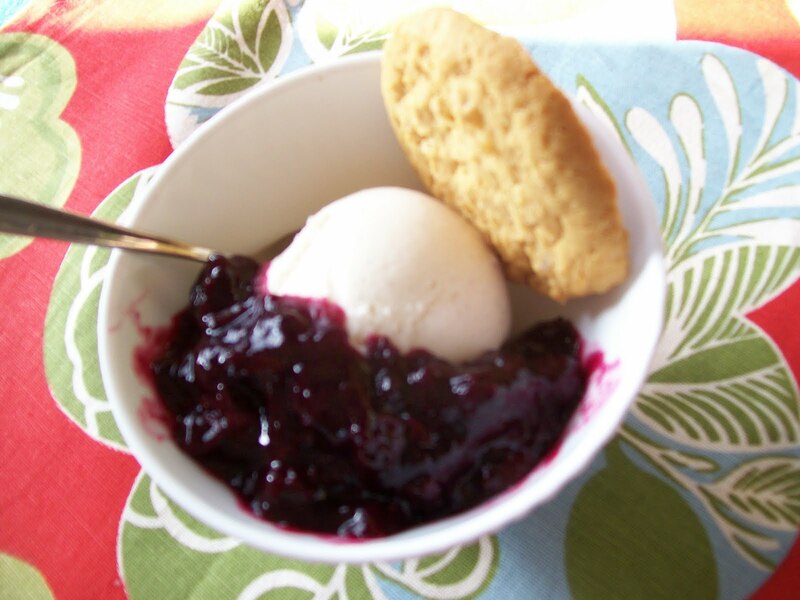 We make homemade even in the winter with the wonderful tabletop makers, but there’s just nothing like fresh fruit on ice cream or, better sometimes, a fruit topping made on your own stove in 10 minutes or so for summer fun. Storebought ice cream will do, or you might try gelato that’s full-flavored and much lower in calories and fat. In a 3qt. saucepan, place 3-4 c fresh, soft fruit along with about 1/4 c -1/3 c white sugar and a cup of water. (Use a bit more sugar for rhubarb and taste any fruit to see if you need more or less sweetner.) If you like cinnamon, add a pinch for extra flavor. You could also stick in a cinnamon stick or a little vanilla. For the blueberries, I added about 1/2 tsp grated lemon to the mixture. Heat the fruit, water, sugar and flavoring, if used, over medium heat until boiling. Turn down heat and simmer until thickened and to the texture you desire, stirring often. Add a little water if needed. Serve over ice cream hot or cold. Makes enough for 4-6 servings, depending on size. Fine to make it ahead and refrigerate. The beautiful thing about this sort of summer dessert is that it is both easy and delicious; you have a great dish in about 10 minutes. If you need something else, serve some shortbread cookies with it. Thin ginger snaps make a nice foil for some fruits like peaches or nectarines. Use a lovely white bowl to show off the colors and you’re in business. Enjoy these last couple of weeks of summer and dream outdoors while you still can. Draw your friends together for just dessert and pull out the deck of cards to play outside. Fall will be here sooner than you think. Smile while it’s still green! 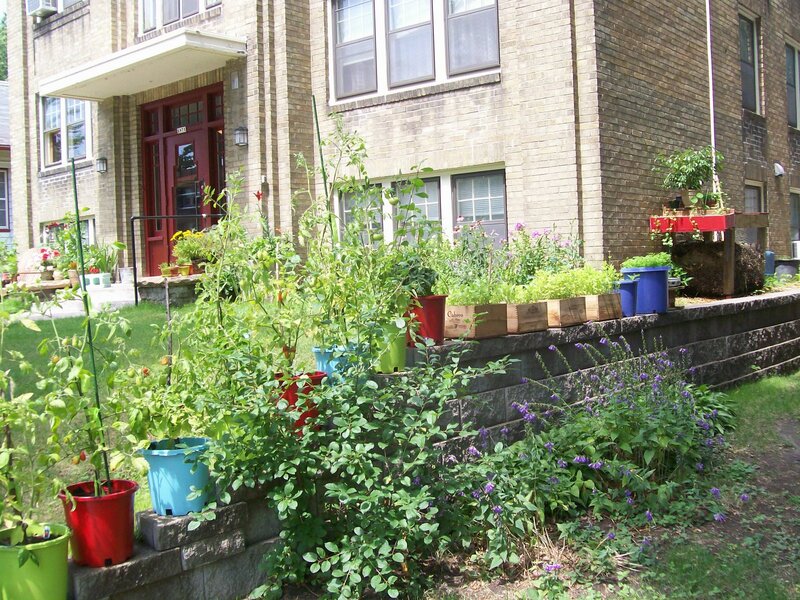 This beautiful city garden… Pots full of tomatoes, herbs, onions, peppers, you name it. St. Paul is into the Victory Garden big time. There are many front yards turned into veg gardens, but this one stole my heart. Even in apartments, people with a heart for fresh food find a way. 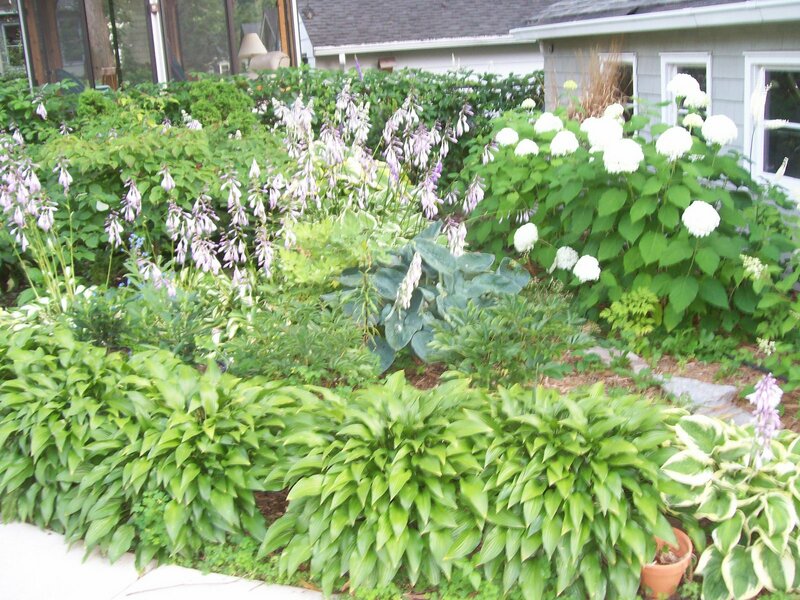 Another beautiful example of a city garden in my friend Margo’s backyard. Could summer get any better? Keep walking in your own neighborhoods; what lovely places do you find? 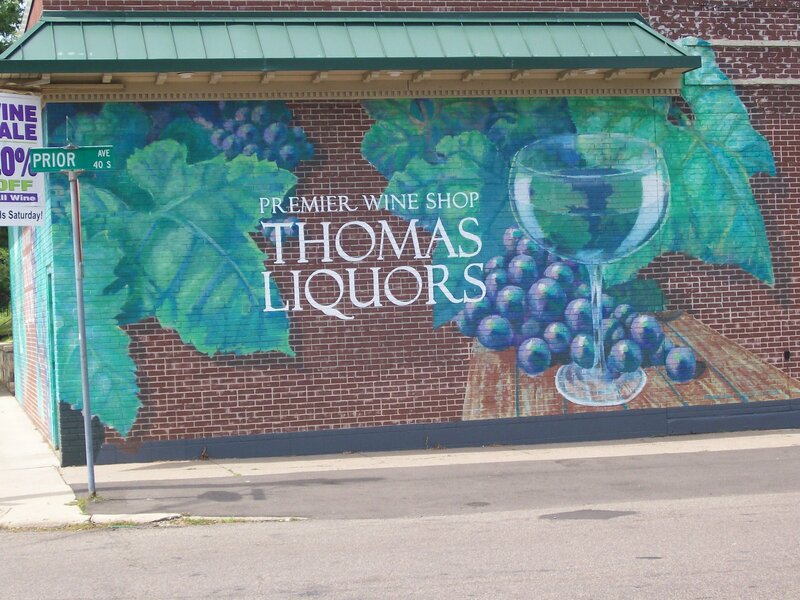 Of course, you might have to stop at Thomas Liquors on your walk. Surely a great bottle of Oregon Pinot Noir rose (08) would be jumping into your bag since you knew you were cooking Walleye St. Paul tonight. Just missed the yearly 20% off sale and had to pay full price. God is good; rose is tres chic and tres cheap. They love dogs there; bring your pooch. 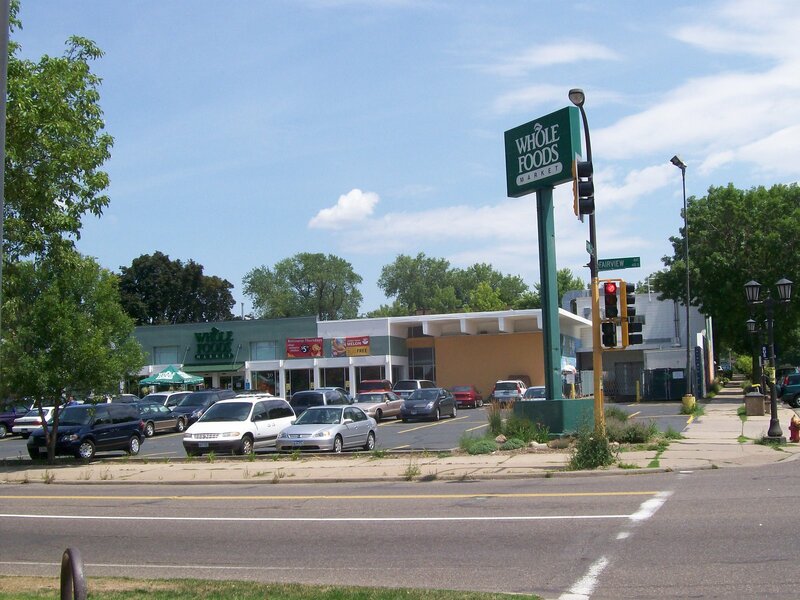 Back east a block to Whole Foods for some fresh berries for breakfast yogurt, as well as the fresh fillet of walleye. Of course the fishmonger said there were no bones. Of course he lied. Trekking home, bag full of rose and walleye, I knew how blessed I was. #1 I was living and studying in such a phenomenal place. #2 I had the money to buy the food I needed. #3 I had the ability to fix it in a healthy place with safe water. #4 I had someone I loved waiting for dinner with me. Answers to prayers asked and unasked. Of course, I had to figure out what in the world to do to the walleye once I got it back to the apartment. I’d love to know what YOU do with walleye. 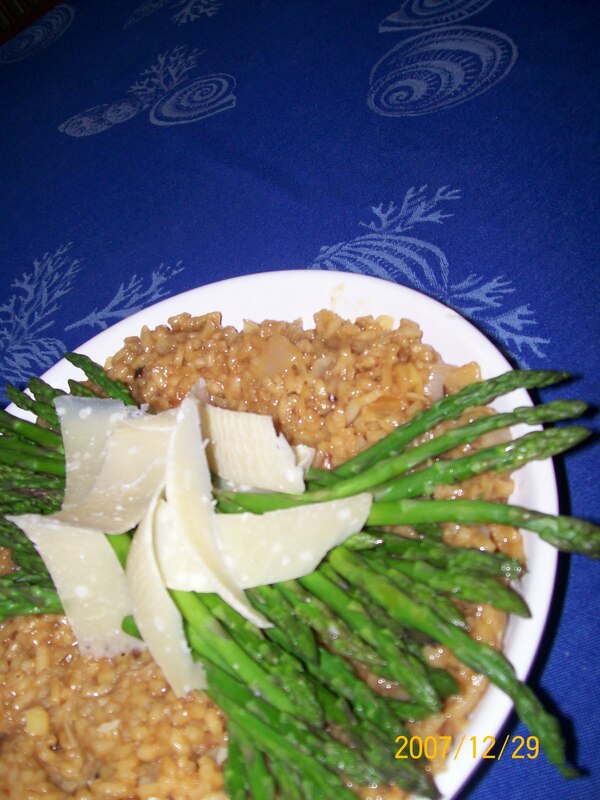 So here’s what I came up with based on available ingredients and my need for a healthy dinner quickly. 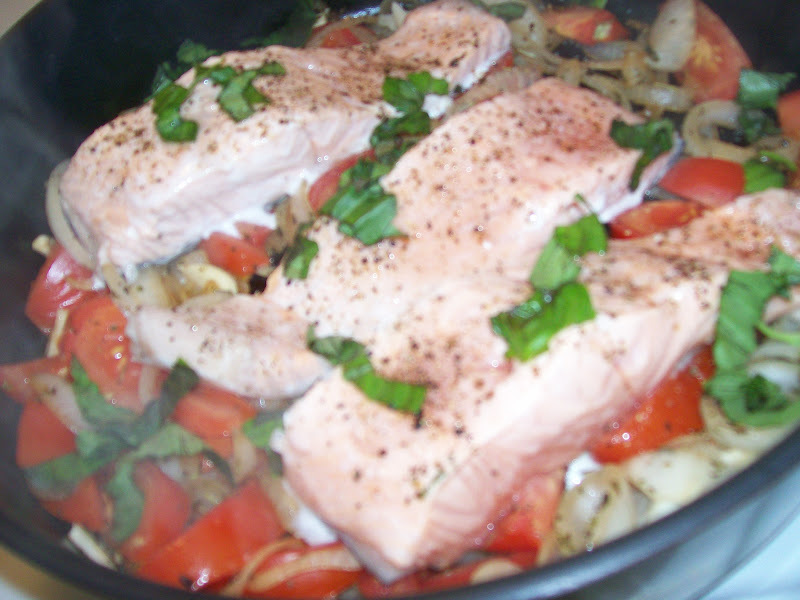 Basic formula: saute greens w/ onions; add fish. Eat. Spray grill pan well with cooking spray and heat pan to medium. Place sliced potatoes onto pan and salt and pepper well. Cook until brown on one side; turn and cook until brown and tender. Remove to plates; cover w/ foil. Heat 12-14 inch saute pan with 1 T olive oil and add onion. Cook until just beginning to be soft and add chopped chard. Cook 2-3 minutes; add garlic. Salt and pepper to taste. Add spinach. Cook 3-4 minutes, stirring often. 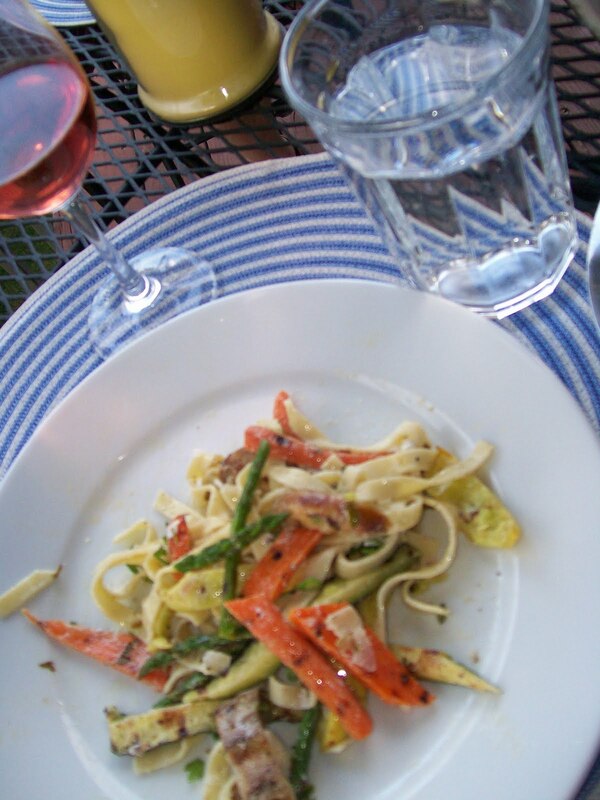 Remove all vegetables to plate and cover to keep warm. Add other tablespoon olive oil to pan and carefully place floured and seasoned walleye fillets in pan. Cook over medium heat until one side is light brown; turn and cook until just done, about five minutes. 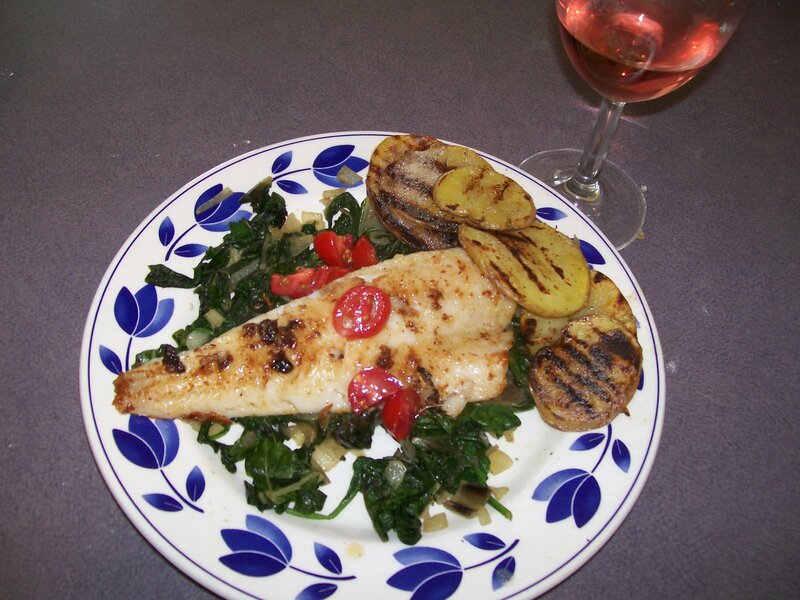 Divide vegetables between plates containing potatoes and top chard with a piece of fish, reserving third piece for seconds for hungry person. (Or tomorrow’s eggs) Garnish fish with chopped tomato and serve while warm. Squeeze fresh lemon over entire plate. Watch for tiny bones. MUST READING: Michael Pollen’s food piece in the NYTIMES Magazine today (Sunday, 8/2/09)). Be human; cook. Along with our thumbs, it’s what separates us from the other animals says one part of the long, but excellent article. I’M LISTENING TO: Bernstein’s MASS. I perhaps have no choice, as it’s one of my conducting pieces for the week. Pray for my shoulder to relax as I learn to beat 5/8 in relaxed mode. If you think this is possible, tell me how. This is our last week in St. Paul. Next weekend, it’s a long, leisurely drive back to the Springs with our sweet pup. I’ll miss the ‘hood so much, but will be so very glad to get home. On the way…Badlands and Mt. Rushmore. Here’s Gabby (right) with good buddy Max… Gab will miss her. Me, too. Sing a new song as you cook from scratch; this is faster than going out for fast food!